With a strong upright growth habit, Beberis Helmond Pillar provides landscapers with a versatile plant with good coloured foliage. 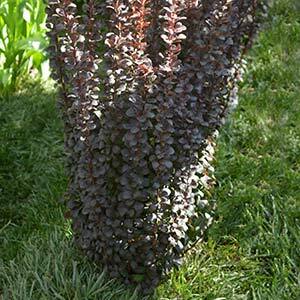 It is the strong columnar habit in combination with the foliage colour that make this such a useful landscaping plant. The full name is Beberis thunbergii var. atropurpurea ‘Helmond Pillar’ and this small shrub can be used in a range of landscaping applications. Excellent as a feature plant in the garden border where the upright nature and attractive foliage add a sense of height. Also suited to planting as a low border or screen. Excellent for use in smaller gardens due to its compact habit. Common Name – Beberis Helmond Pillar, Helmond Pillar Barberry. Height – Will reach around 1.5 to 2 metres in height. Spread – Over time will spread to around .7m at the top. Growth rate – Regarded as having a moderate growth rate. Position – Best in full sun to a little afternoon shade. Soil – Best in a humus rich well drained soil, however tolerant of poorer soils. Not suited to wet clay soils. Drought tolerance – Good tolerance of dry periods once established. Foliage – Small, rounded and a deep red to burgundy in colour. Foliage colour is best in full sun. Flowers – Small and yellow in spring. Container growing – Berberis Helmond Pillar grows well in containers. Beberis Helmond Pillar is available for sale from the following participating wholesale nurseries.